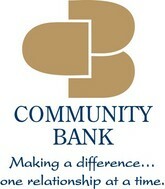 The Community Bank offers exclusive banking solutions. The personal banking solutions offer cash deposits and savings; card services; online banking solutions and others. Under the business solutions they offer credit and loan solutions; cash deposits and savings. They even arrange for credit and other business loans, apart from taking care of mortgaging solutions and arranging personal loans for businesses. Their community financial advisors possess specialized knowledge and skills to handle complex financial situations. They also offer credible service related to investment management and financial planning. The organization has the seed of origin embedded in 1902, when Crooksville Bank started operating. Later on, they changed their name as The Community Bank in 1992. There are currently 0 consumer reviews about The Community Bank available. Share your review. Please take a note that you are about to post a public review about The Community Bank corporate office on CorporateOffice.com. This review will be public, so please do not post any of your personal information on this website. If you would like to contact the corporate offices of The Community Bank, please use their contact information such as their phone number, website, and address listed above to contact them. However, sometimes staff from The Community Bank headquarters do read the reviews on this website.